These beautiful veggies came from a farm close to us that is set up as a CSA, which stands for Community Supported Agriculture. You buy a share in the CSA at the beginning of the season, and you enjoy a box of local, organic, seasonal vegetables each week. The first time I had garden-fresh broccoli (so sweet! ), I was completely sold. In a time where we get apples shipped from New Zealand, broccoli shipped from California, and zucchini shipped from Mexico, we have become disconnected from our food sources and the people who grow it. These are all foods that grow in Canada, and if we are able to find local produce and shift our diet to be more seasonal, we can enjoy fresh delicious food that was ripened by the sun in the fields rather than by chemicals en route. CSA’s were developed to bring farming back to a local and economically viable level. Because produce is purchased directly from the farm, the farmers get a fair price for their efforts, and the consumer gets fresh veggies at very reasonable prices. 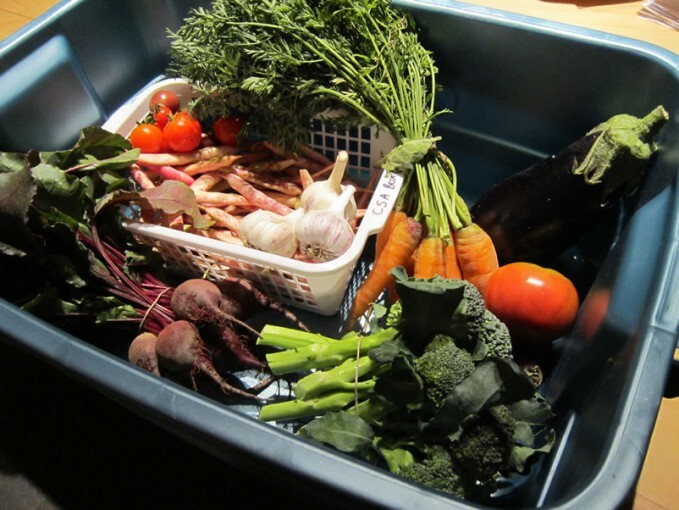 In a CSA, the members buy a share at the beginning of the season and get a share of the weekly harvest. Members share in the risk that farmers take with the weather, risks which have pushed so many small farmers out of growing food. A bad weather year could mean an average harvest, but the CSA’s we’ve been part have usually provided us with so much food for our share that we’ve been able to freeze some for the winter. They also offer recipes to help find ways to use the variety of heirloom organic veggies, and some help foster a sense of community and connection with potlucks or an option to help with the harvest in exchange for a reduced share cost. It’s also been an amazing experience for our kids to see firsthand where their food comes from and how it grows. Broccoli reallys grows like a small bush! Snow peas are really better than candy just out of the garden! And my kids have consistently chosen a fresh baby carrot over any other choice of food. Who could beat that?